“The entire community is enriched when we recognize the deep reservoir of amazing and talented women in Cook County,” said 16th District Cook County Commissioner Jeff Tobolski. In observance of Women’s History Month, the Cook County Commission on Women’s Issues, County Board President Toni Preckwinkle, and the Cook County Board of Commissioners joined together on March 02, 2017 at the Chicago Cultural Center to host the 20th Annual Cook County Unsung Heroine Awards Breakfast. Each year the Cook County Commission on Women’s Issues sponsors the “Unsung Heroine” Award and honors one woman from each of the seventeen Cook County Districts whose contributions have silently, yet notably, made a positive impact to their communities. This year, Commissioner Jeff Tobolski and Women’s Commissioner Terri Rivera selected Kathy Donahue-Coia as the 2017 recipient of the Cook County Unsung Heroine Award for the 16th District. 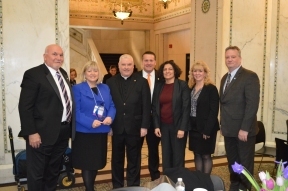 Ms. Donahue-Coia was recognized for her 32 years of service as a licensed clinical social worker for the Catholic Charities of the Archdiocese of Chicago, one of the largest not-for-profit social service agencies in the Midwest.